Years ago, when Flickr, the photo-sharing website, first appeared on the scene, the designers delighted their users with a variety of interesting innovations. One of those innovations was something that now seems strikingly simple in concept: a customized home page. At that time, practically every other website had a standard home page. When a user typed in the site’s main URL, they saw an identical page to every other user. Flickr’s page was different. When registered users typed Flickr.com into their browser’s address bar, they saw a personalized page complete with their own latest uploads and recent pictures from their friends and contacts. We interviewed users who told us they found the personalized page very exciting, including the happy “Hello” that appeared in a different language each time they visited. It wasn’t very long before other sites started incorporating similar capabilities. We saw many sites with a personalized dashboard showing recent activity. We even saw other sites copy the multi-lingual greeting prompt. The interesting thing is, as these innovative features propagated into other sites’ designs, they became less remarkable and less delightful to those sites’ users. These users rarely mentioned the features and never seemed as excited about it as those initial Flickr users did. Years ago, we came across the work of Noriaka Kano, a Japanese expert in customer satisfaction and quality management. In studying his writing, we learned about a model he created in the 1980s, known as the Kano Model. This model predicted users’ reactions as the key elements of Flickr’s personalized home page appeared on other websites. It predicted why users were initially delighted and why the delight faded over time. We find the Kano Model to be an indispensable tool for designers. Let’s take the model apart, so we can understand why it’s so useful. The easiest way to think of the model is on a two-dimensional grid. The two dimensions of Kano: Investment versus Satisfaction. The horizontal axis represents the investment the organization makes. As investment increases, the organization spends more resources on improving the quality (remember, Noriaka was a quality guy at heart) or adding new capabilities. 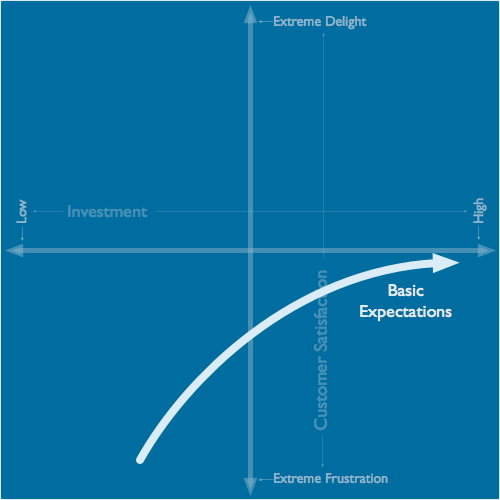 It’s against the backdrop of these two axes that we see how the Kano Model works. It shows us there are three forces at work, which we can use to predict our users’ satisfaction with the investment we make. When blogging first started, a blog author needed to know basic HTML to do anything fancy with their formatting. Many blogs were absent of any style just simple words on the page. The first blogging systems added basic formatting features, like bold and italics, to their text input fields. These features would give a small word-processing feel to an otherwise bland input tool. Users were delighted. The designers took the hint. They started adding more word processing-like features. We saw bullets, justification, image insertion, and fancy link capabilities. Each feature took more investment and returned more satisfaction. Performance Payoff-The more organizational investment, the more user satisfaction. We’ve all seen instances like this. By adding new features or cleaning up the quality of the product, we generate more shouts of delight from a thankful audience. 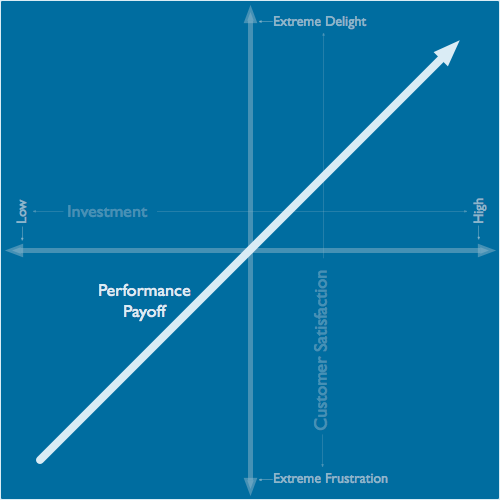 This is the Performance Payoff, the most visible force of the Kano Model. Every design has a performance payoff as the design team evolves the functionality and quality. Its key designers understand how much delight is generated with each new feature, as it takes more investment to garner more delight over time by just adding features in this fashion. Google Docs changed the game of office software. It eliminated the notion of a file and let your data live in “the cloud.” Google Docs makes it easy to share and collaborate with colleagues because it eliminates the emailing of duplicated files. Everybody works from the same source. Each person sees the same changes instantly. A downside of editing in the cloud is the need for constant connectivity. If a user is editing someplace where the connection is spotty, intermittent problems occur. Something as simple as saving a draft becomes a frustrating moment for the user, who doesn’t know the state of their document. Document saving isn’t a feature that will make anyone excited. But its absence or unreliability will frustrate folks immensely. Basic Expectations: The bad frustrates, yet the good doesn’t impress. This is a defining trait of the Kano Model’s Basic Expectations. Capabilities that users expect will frustrate those users when they don’t work. However, when they work well, they don’t delight those users. A basic expectation, at best, can reach a neutral satisfaction a point where it, in essence, becomes invisible to the user. Try as it might, Google’s development team can only reduce the file-save problems to the point of it working 100% of the time. However, users will never say, “Google Docs is an awesome product because it saves my documents so well.” Users just expect the software to save their files correctly at all times. Basic expectations are often related to bugs and reliability. When a Skype conversation is cut off by a bad connection, it can frustrate the people on the call. When an e-commerce application double charges the site’s shopper, that’s frustrating, too. However, a basic expectation may be something the user is already familiar with, such as automatically receiving a confirmation email after they complete a transaction. Your users may expect your product or service to have features they find in other products or services they frequent regularly. As a designer, you need to pay close attention to the basic expectations of your users. It’s easy to focus on the new and novel elements of our design, forgetting to look back at how our users are using our existing capabilities while making sure we’re meeting all of the basics. Excitement Generators: Design elements and features that delight the user. 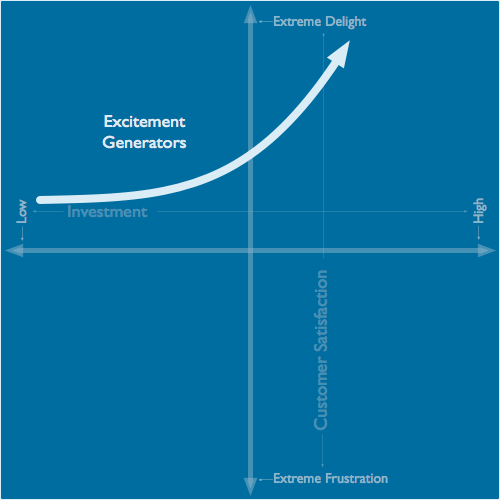 There are many ways to add the Kano Model’s Excitement Generators into the user experience. Zappos does it through their delivery operations and customer support, but that’s not the only way. Groupon generates delight through their clever use of advertising copy for the products they sell. For example, a recent ad for half-price gourmet brownies started with: “Without chocolate, the world would still be under the oppressive rule of the Turnip King and his tasteless parsnip army.” Groupon’s customers regularly say they find the clever copy delightful. Tripit.com’s users tell us how much they love the travel-itinerary site’s automatic confirmation parsing feature. When the users email their hotel or airline confirmation email to the site, it automatically parses out the dates and locations, adding it to their trip’s itinerary. If no itinerary exists for the reservation dates, it automatically creates one. These Tripit users love that they don’t have to enter a ton of information to get all their reservation details into one, nicely formatted page. Of course, excitement generators won’t delight users who are frustrated when you don’t meet their basic expectations. Designers need to ensure they are focusing on both ends of the model. A great model can help us understand what we’re seeing. Flickr’s delightful home page experience, for example, became less delightful when it started showing up in other designs. 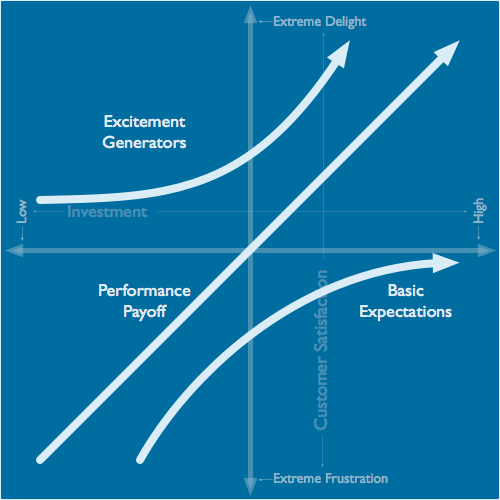 One of the predictions that the Kano Model makes is that once customers become accustomed to excitement generator features, those features are not as delightful. The features initially become part of the performance payoff and then eventually migrate to basic expectations. Flickr’s designers did something delightfully novel by creating a personalized home page, with a customized dashboard that showed the users’ own photographs, contacts, and activities. As other sites implemented similar dashboard-like pages, these users became more accustomed to it. The feature lost its luster. Today, many users will be frustrated if they don’t see a dashboard page, or if they’re required to log in before seeing it. The feature, once a delighter, is now a basic expectation. 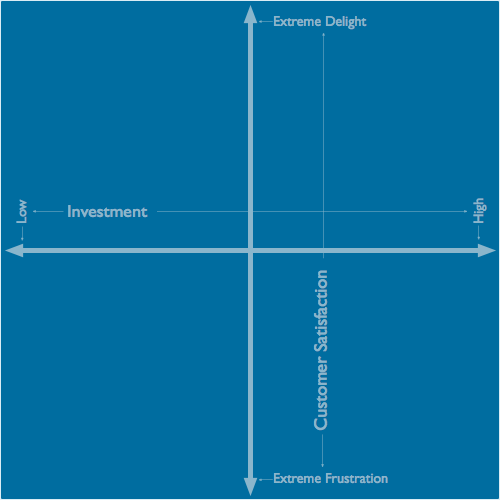 The full Kano Model: A tool to predict user satisfaction. Working with our clients, we’ve seen teams prioritize their work using the Kano Model. They’re constantly monitoring their users’ current basic expectations, to make sure there’s nothing they’re missing. They are always on the lookout for inexpensive ways to add excitement generators. And they use the performance payoff to help understand how much delight they can generate with new features. The model becomes a great way to explain to stakeholders and project owners how to tackle hard decisions. It’s a great way to keep teams focused on the right priorities. Identify your customer’s hidden problems using the Kano model. Bring your team to our 2-day Creating a UX Strategy Playbook workshop and together learn how to institute the Kano Model at your organization. Together you’ll also create your team’s unique strategy playbook, using other proven strategies to deliver better products and services. Look over our upcoming workshop dates, include our November Manchester, UK workshop in partnership with ThoughtWorks here: Creating a UX Strategy Playbook.